Wash and dry with fantastic efficiency whilst safe in the knowledge that your clothes are being taken care of. 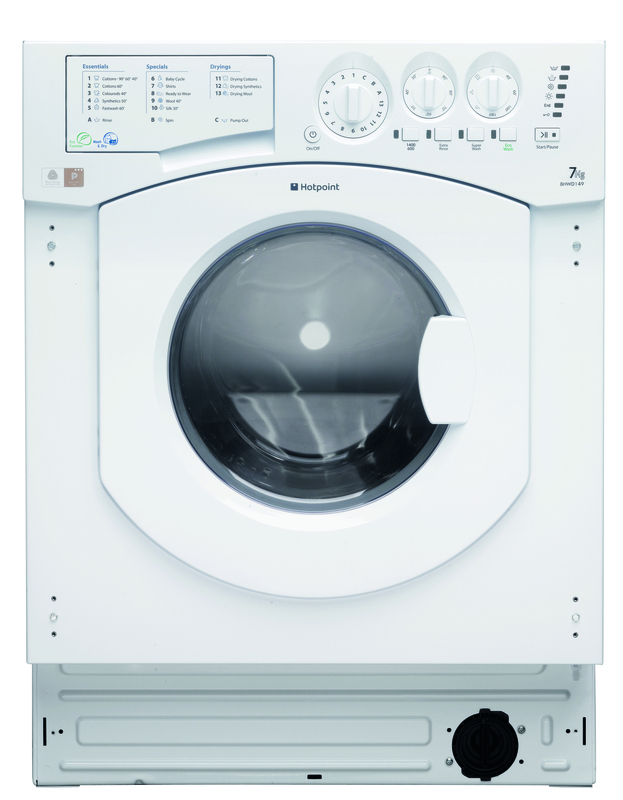 The Hotpoint Aquarius Built-In Washing Machine (BHWD 149 UK1) has everything your busy household needs. Ready to remedy those emergency laundry moments, the Ready to Wear program provides an effective wash and dry cycle in just 60 minutes to help get your day back on track, whilst Reduced Creases serves to liberate your time from the ironing board. Taking care of all your washing needs, this model will be particularly appealing to those who suffer from sensitivity to pollen, dust and pet dander. The Aquarius includes an Anti-Allergy wash and rinse cycle, so effective it removes 99.9% of major allergens and has been awarded the Allergy UK Seal of Approval. Need an extra boost to tackle the dirt picked up by babies and toddlers? Use the Baby Cycle to revitalise their clothes ready for the next adventure. Sending extra love to your favourite knits, this model also comes with Woolmark Platinum Care  a delicate wash program which uses extra gentle drum actions and low spin speeds to reduce the friction between delicate fibres keeping them premium for longer. Providing 16 wash and three drying programs, delicates and silks get special attention to care for their unique fibres whilst the Set & Forget drying system uses clever sensors to monitor moisture and temperature levels inside the dryer, automatically stopping the cycle once your load is dry. Exceptionally convenient whilst maximising energy efficiency and ensuring your clothes stay in tip-top condition, the 7 and 5kg drums (respectively) marry with 1400rpm of variable speed to create a great all-round laundry experience whilst the Super Silent Motor ensures chores won't interrupt conversation.